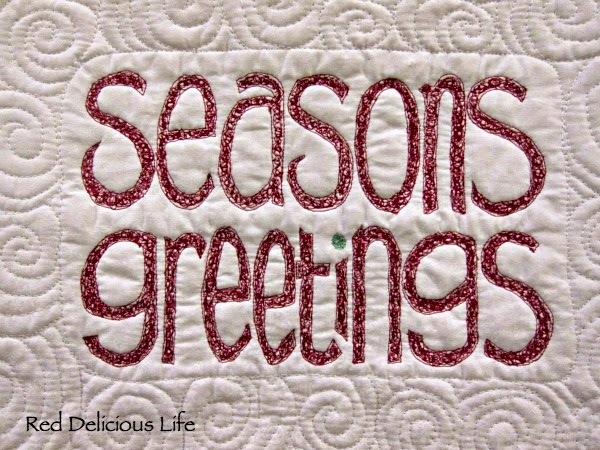 If you've not seen this on some of the other quilting blogs, you're in for real treat. 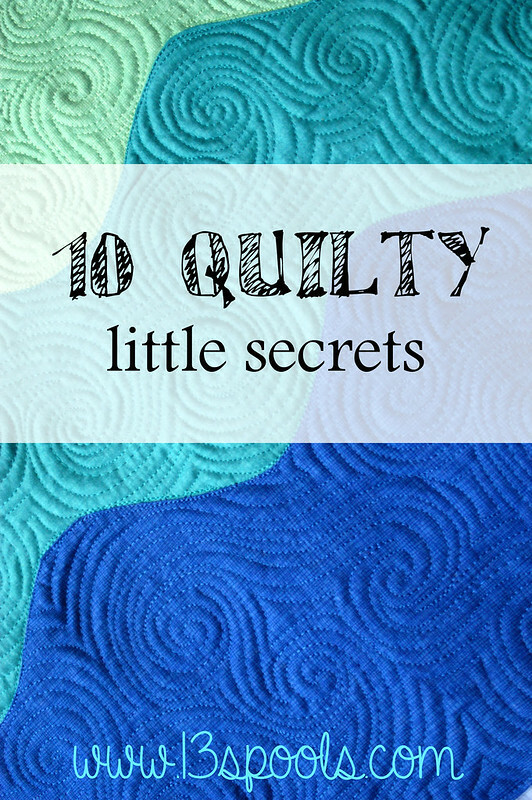 Amy over at 13 Spools made a post about her 10 Quilty Little Secrets and it spread like wildfire. 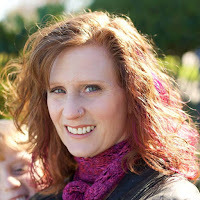 It prompted so many others to chime in with their list that she opened up a link party just to share our confessions. Some of them are hilarious, my favorite so far being Shauna's number 10 (I won't spoil the surprise, you have to click over to read it!). I've decided to add my own little secrets to the list. You can find the others here. I LOVE LOVE LOVE polka dots! Nothing makes me happier. Like so many others have confessed, I too, iron. Pressing is for sissies and triangle blocks cut on the bias. Then it's okay. I don't understand the craze for the Cotton + Steel fabrics. They're okay but I don't feel the need to possess any. I don't like appliqué. I'll do it if it's the best choice for a project but it's usually my last choice. I have an addiction to Mary Ellen's Best Press. I have no idea what's in it, but I love it. I'm not a big fan of scrappy or wonky. Correction - I can tolerate scrappy but wonky drives me nuts. I cringe whenever I see the word Accuquilt. Maybe because it's a tool I know I can never afford (or justify the expense) but if I see that it's a pattern or project made using one, I tend to stop reading. I really want to try glue basting but I'm chicken (and I don't have a super fine tipped applicator). I have attachments and accessories to my sewing machine that I have NO IDEA how to use. I've been known to sell my son's discarded toys and outgrown clothing and use the money to buy fabric. 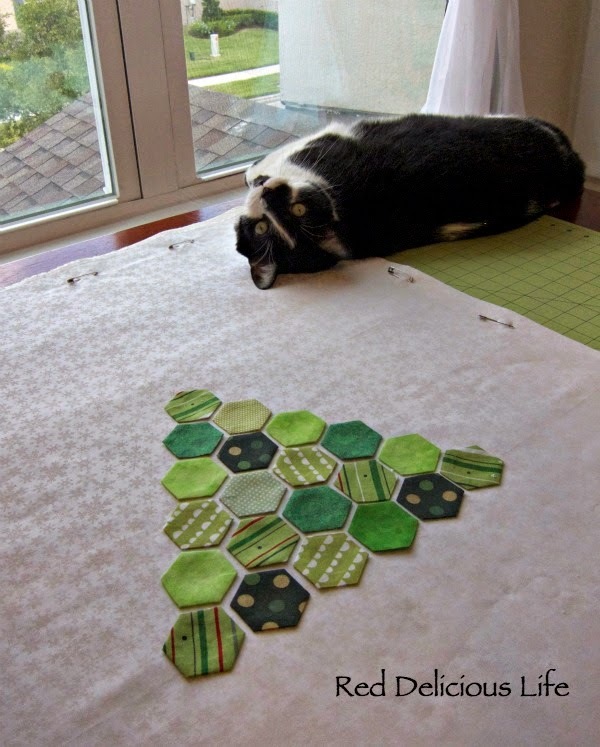 I haven't gotten much quilting done in the last week due to some unexpected circumstances. A few weeks ago I had to have my car towed from our house because it was leaking transmission fluid. Somehow a hose had dislodged itself and gone missing, resulting in needing an entirely new transmission put it. Thank goodness I was the original owner of the car and it was covered under the 100,000 mile power train warranty so the only thing out of pocket was the tow. Given the car's age and some of the upcoming work that would need to be done, my husband and I started thinking that maybe it was time to get a new car. We are a Pruis loving family - we're currently on our 2nd one. 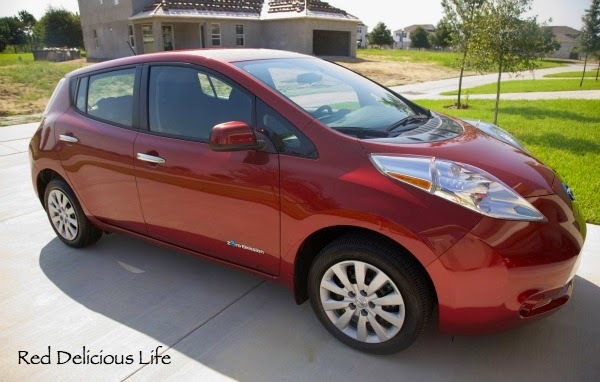 I personally love the idea of an all-electric car to reduce our carbon footprint, but getting an EV with a long mileage range is just not in our budget right now. Luckily all of my driving is short range and thanks to the mad negotiation skills of my husband, we now have a shiny new Nissan Leaf! 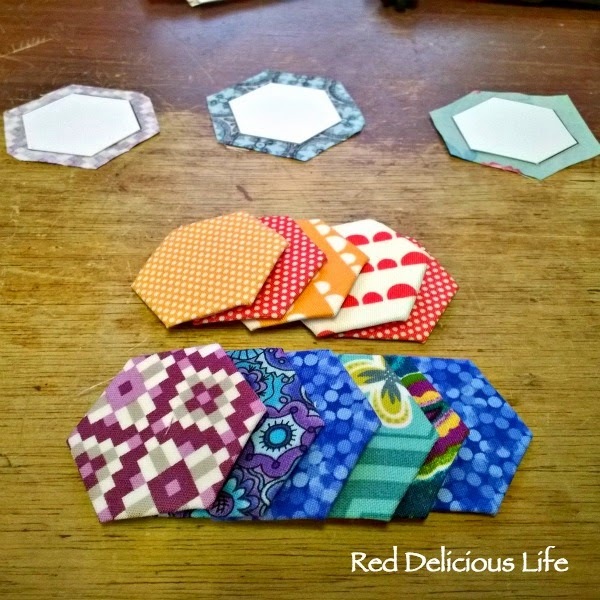 I'm so excited to finally share what I made with some of my hexies that I made last week. I made a holiday wall hanging! I just love how this turned out and it was a fast project too. Well, fast for me, which was about 2 weeks. It measures 19" x 25" and I used all scrap fabrics. As I'd mentioned in an earlier post, I'm not really a fan of hand sewing but I still think the hexies are cute. 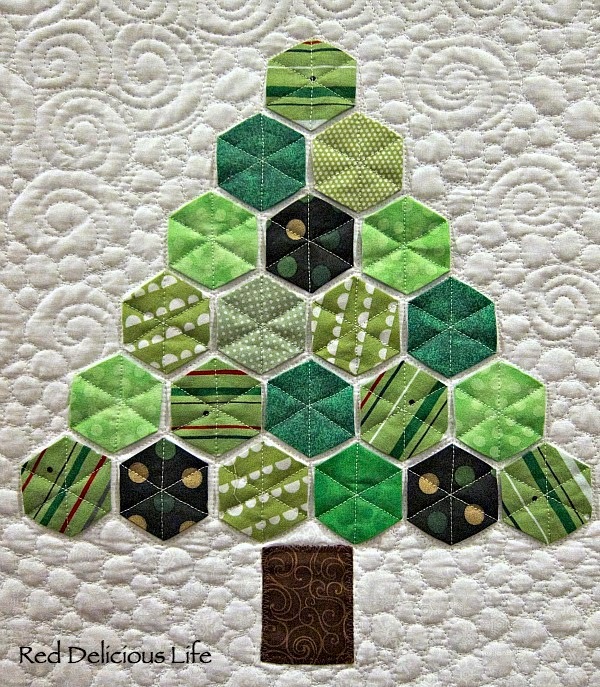 After seeing this on Pinterest, I knew immediately that I wanted to make a Christmas tree using hexies. Here's how I made it. After making the hexies for my tree, I rummaged through my stash to find some white fabric, a large scrap of batting, and some backing fabric. 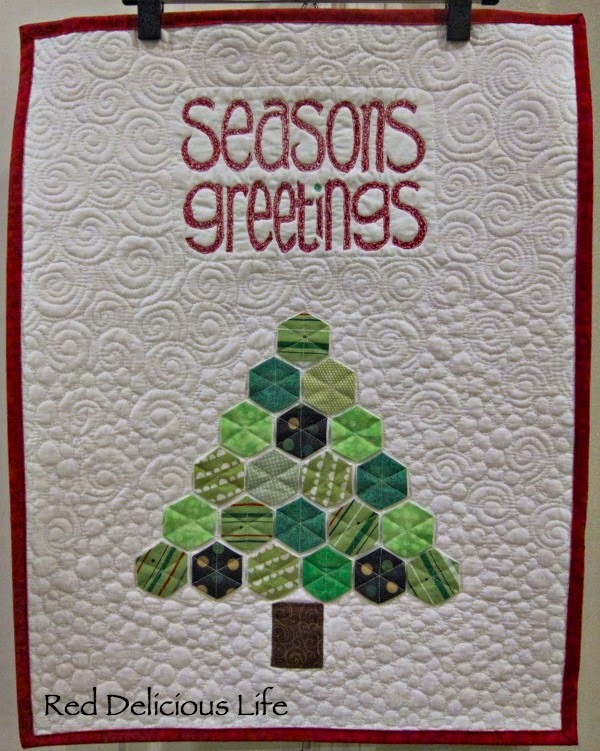 I basted it just around the edges using safety pins, determined where I wanted to tree to be and laid out my hexies. As usual, my assistant Oliver was close at hand to made suggestions. After I decided on a layout that I liked it was time to secure them temporarily to my quilt top. I just used a dab of glue to keep them in place. Once they were all glued, I then finished basting around the tree. Now it was time to start quilting. 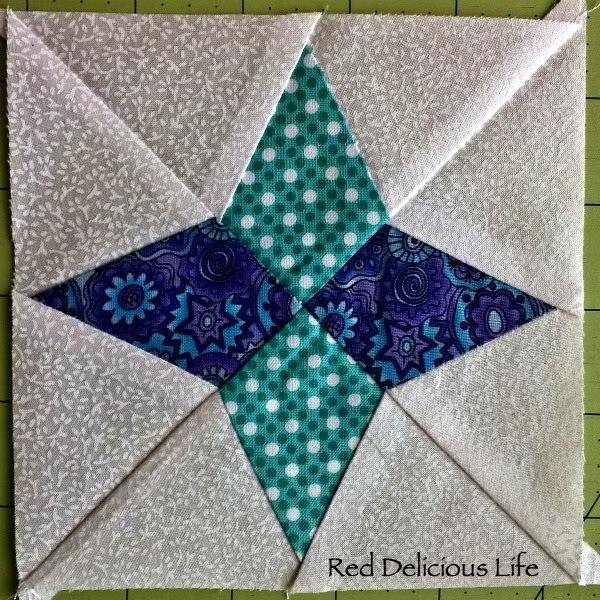 I just did straight line quilting for the hexies, just like in the project I found through Pinterest. After that was done, I stitch appliquéd a little square for the tree trunk. For the background, I liked the idea of snowballs at the base and gradually changing to swirls as I moved upward. My favorite thread for quilting is Isacord but what I had on hand was more of a cream color. Plus, I wasn't sure I'd have enough so I opted to use white Aurifil thread instead. I've never quilted with it before, only pieced. It wasn't bad but I think that poly threads (like Isacord) just glide more smoothly for free motion quilting, especially where you have to backtrack a lot (like pebbles). 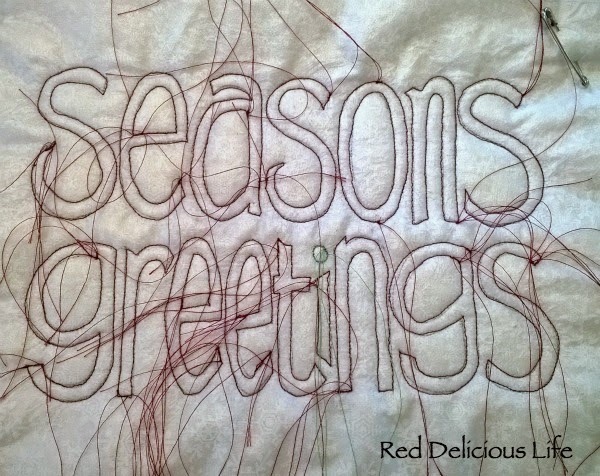 I chose a modern looking font for the Seasons Greetings saying and used a dark red poly thread to outline and paint it. Once again, I used my trusty Press'n Seal to copy the lettering from paper and then sew over it once I placed it on my quilt top. When I showed it to my son, he immediately said that we need to get out the train to put under the tree. He's 4 and doesn't exactly have a great sense of calendar time and can't wait for it to be Christmas again so that we can put up our tree and set up our Lego train set around it. It got me thinking that maybe I should add a few gifts under the tree. It'd be easy to appliqué a few even after it's been quilted. So there you have it. 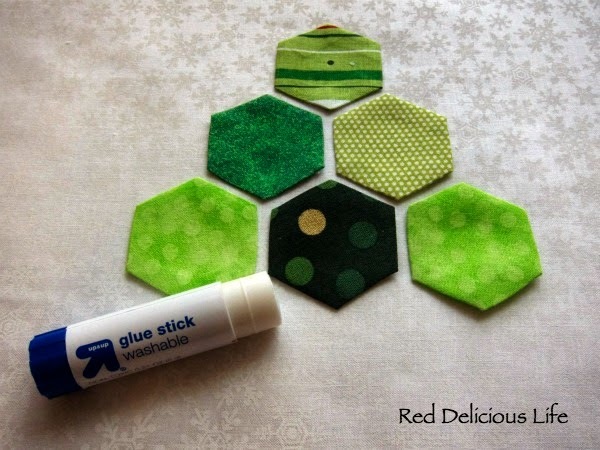 A cute little wall hanging for the holidays using hexies. In addition to the usual link parties (found here), I'm also linking up to Ho-Ho-Ho...And On We Sew over at Missy Mac Creations, Amy's Free Motion Quilting Adventures, and Free Motion Mavericks at Lizzie Lenard Vintage Sewing. I'm not one who likes to hand sew. If I can do it on my machine I will. 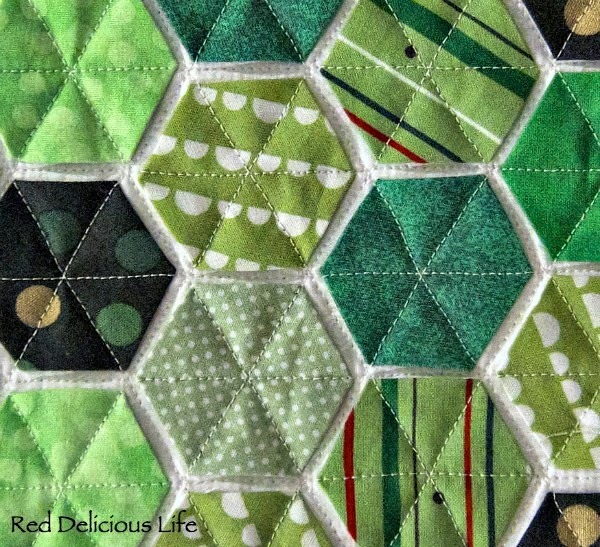 Bind a quilt by hand?! You must be joking. Honestly it would probably take me a week for a baby quilt. I grudgingly hand sew my quilt labels on - that's if I haven't sewn them onto the back before quilting or cleverly attached it when sewing on my binding. If I'm going to have a needle in my hand, I'd prefer it to be a size 7 knitting needle, thank you very much. Then I started seeing all these cute hexie projects. I'd pin a few that caught my eye (don't get me started on the joys of pinterest!) and try not to think about them. Then someone else would post a picture of a cute hexie and I'd linger just a bit longer... Well, I finally caved and decided to try it myself. I had a 3 hour volunteer shift at Give Kids the World, manning the Welcome Booth. It's a solitary job and you have long stretches of nothing to do. I usually bring a book to read but this time I decided to bring some supplies and see what the hexie craze was all about. These fabrics are for my block that I plan on keeping and not what the Queen Bee will be receiving. Here is what I've learned so far. Pressing to one side doesn't come naturally to me, but I love the way the seams nest perfectly when joining sections. I need to adjust where I sew for a scant quarter-inch seam due to pressing to the side. Otherwise I'm off just a bit. Making a template for each piece was the best advice I've taken away from this adventure. I think my previous paper piecing attempts would have been more successful if I'd known to do that. Despite the instructions, if I trim all 3 sides of the triangle pieces before joining them, I would consistently end up 1/8-1/4 inch small once the block was put together. So now, I'll trim the 2 inner sides and leave the long edges of my triangles untrimmed until the block is constructed. Then I have no problems squaring my blocks up to 5 1/5 inches. The June Tailor Half Square & Quarter Square ruler is perfect for squaring up this block. One of my best purchases ever. Out of the 6 blocks I've made so far (still have 2 more to make) - I've only made 1 without any mistakes. If there's a way to mess it up, I have! Accidentally cut off what I've sewn instead of my quarter-inch seam allowance? Done it! Somehow managed to sew down one of the points of a triangle? Done it! Cut a piece too small, despite having the template, and it wasn't apparent until the entire block was put together and saw it when I went to square up? Yep! But that's okay. I learn best by doing and at least I can say that I haven't made the same mistake twice. If nothing else, this has given me the confidence to try some other blocks in the future. 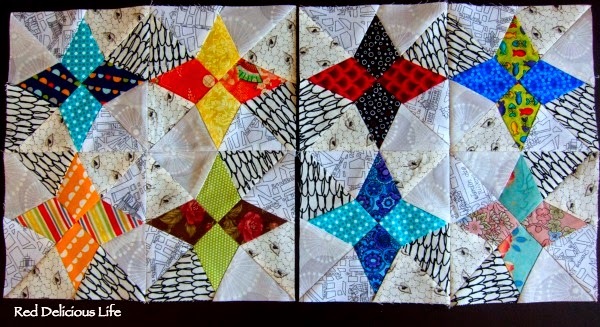 Would I attempt an entire quilt that is paper pieced. I don't know but only time will tell. 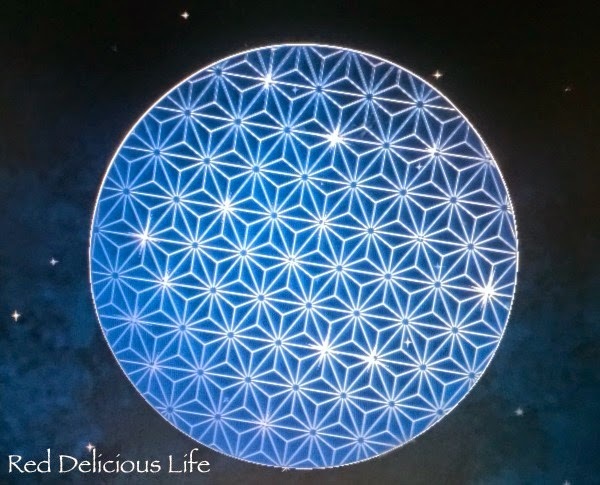 I saw this video this morning and couldn't resist sharing. Hope you laugh as much as I did! I'm very excited to try it, even if I'm a tad bit nervous. It's a paper pieced pattern and I'm not very good at those yet. I've only attempted paper piecing twice before. Warning - not my best work here, folks! The first was this circle of geese and was through Craftsy's 2013 BOM class. That went well enough since I could keep watching the video over and over while piecing it. I then bit off more than I could chew and tried the patchwork cat. I tried using small scraps which was my first problem. I didn't have a stash to speak of at the time so I was trying to conserve my precious fabric. Can't tell you how many times I made mistakes and my fabric was flipped the wrong way and too small. This sad little block didn't even come close to squaring up. I just wasn't ready for one this difficult, and it's made me avoid the technique until now. But I'm up for the challenge and can't wait to get started! I've started rifling through my fabric stash and have found a few low volume fabrics that will work well. 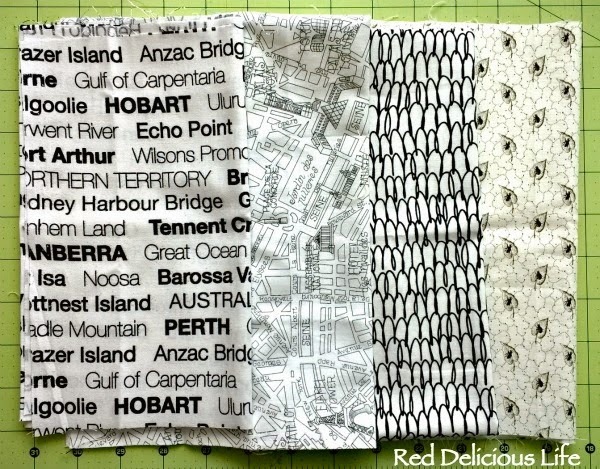 I think I'll save the print fabric though, in case one of my Aussie bee members requests low volume fabrics. 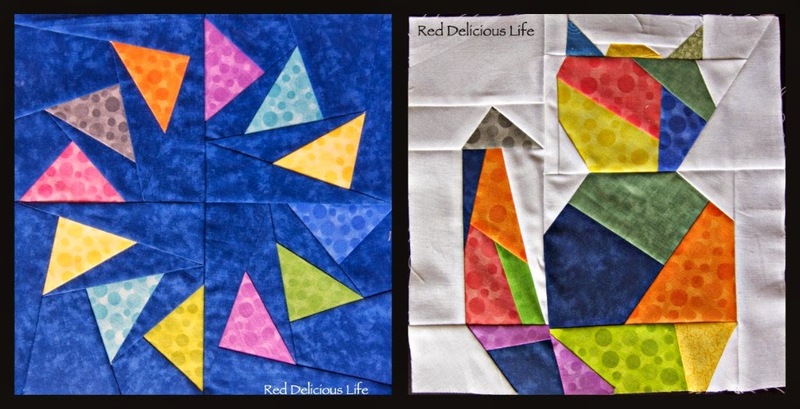 I've also pulled some bright colored fabrics for the kites, but I'm keeping those under wraps for now. Wish me luck!